There is a set of anchors between Horn Piece and Dirge. Useful for getting out from the Red Wall without getting involved with the hordes on Horn Piece. They are on the opposite side of the gully to the start of F-Sharp. The anchors seemed to be sound and there didn't appear to be loose rock issues down that gully. Hornpiece and Dirge. 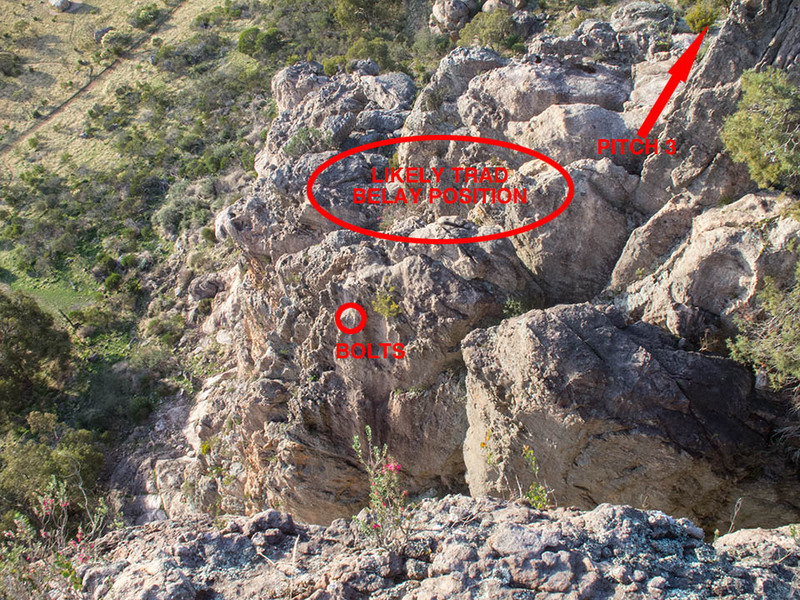 And there is a loose rock issue in that gully. > there is a loose rock issue in that gully. Hard to see any merit in this anchor. I bet the scramble/walk down is way faster than rapping. You must be ill again. Or I am. We agree on something. It also adds to the congestion on the raps below and there's not a lot of room for people on the ledge to get out of the firing line from it. On a busy day, you could have 3 parties belaying directly underneath it and another 3 very nearby. 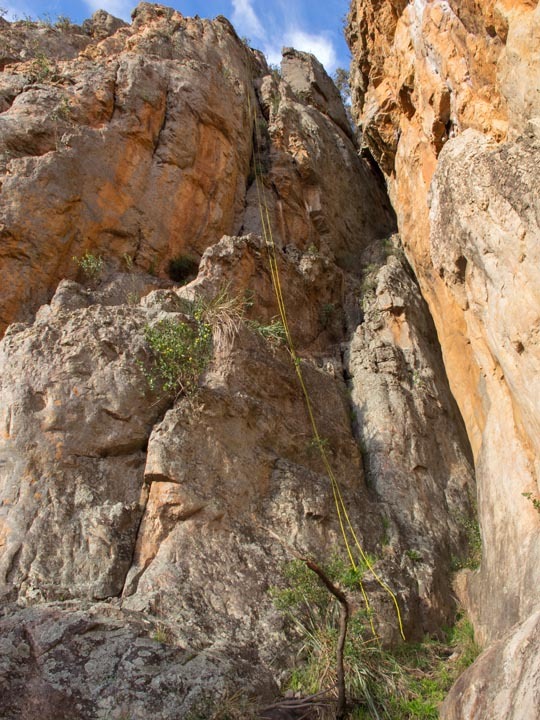 I'm headed to Arapiles this weekend, and have a grinder. Unless there's any objection, I'll chop and attempt to patch any failed bolts. If there's still one good bolt in the anchor, I'll make an assessment whether to chop it or leave it (with the intention in the latter case of coming back to replace the failed bolt), based on whether the rap is doable on a 60m rope, whether ropes dropped from this anchor are likely to land on a Tannin belayer, and whether the anchor seems possible/likely to also be used after approaching from the top (say after climbing Wyrd). But removing any trace of the anchor is a much more likely outcome than replacing it. Go for it. I formed the view (from a distance) the failed bolt could be pulled out without grinding; you might want to take pliers. I also think (not sure) the bolts are placed optimally for rapping and not convenient to the logical belay stance. Can you leave the grinder at home for now? Really should be last resort after other things have been tried. I'll try to have a look at them over the weekend. I'll go up and just inspect and take photos for now, though if it's a glue-in bolt that's had a glue failure, there's not really anything that can or should be done other than chopping it. However if it turns out to be an expansion that could be removed without chopping, or (very unlikely) is just in need of tightening, then that's a different situation. Ok, so the anchor is two expansion bolts with hangers, quicklinks, and stainless chain. The left bolt is loose, but I didn't have a spanner so couldn't attempt tightening it. They are positioned on the right side of the Conifer Crack pipe, a bit higher than the Tannin anchors, so a slight downclimb from where you might otherwise belay at the top of CC pitch 2. Not anywhere where you'd want to belay, but rather in a position intended for rappelling. The rap is 30m and takes you down the wall right of CC that faces Wyrd. It's very unlikely that a dropped rope could hit a Tannin belayer. So, not glue-ins, as had been speculated, and I could not pull the bolt out of its hole at all. Rather it just wiggles a bit and has a spinning hanger. Photos to come when I get home or it starts raining and I get stuck in the Nati Cafe. 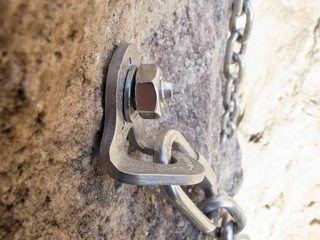 Its probably not a good idea to leave just one good bolt, people might be tempted to abseil of a single bolt. If its more than just a bolt needn't tightening I will happily donate a glue in ring bolt to a competent person to fix it. I started out a couple of times over the w/e to llok at this but it rained each time. Sound likely to be a galled nut on a Fixe-type bolt. 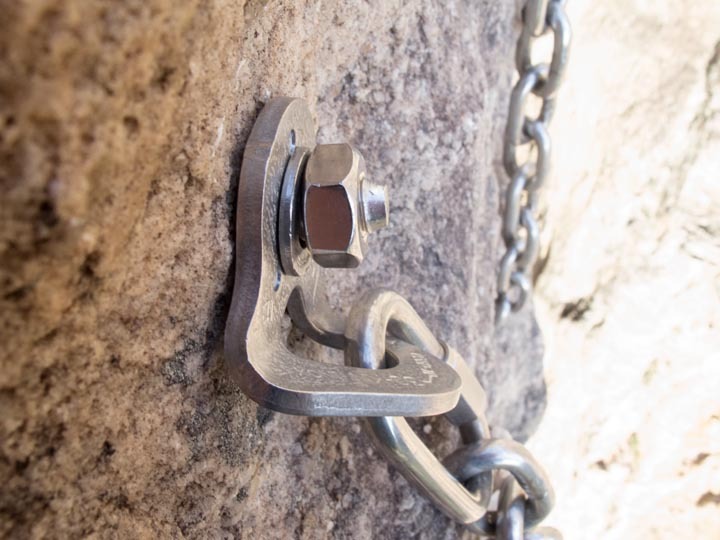 If that's the case then, while disconcerting, It's probably very secure - that nut is not coming off without a grinder or hacksaw and the bolt will push back in the hole a little and then pull out until the collar locks against the wedge. And we have photos. Click to enlarge. The rap station is a pair of M10 stainless stud-type expansion bolts with hangers, quicklinks and chains. The left bolt is the loose one. It's positioned on the right side of the Conifer Crack pipe, lower than where you'd normally set up a trad belay and around right of the arete. It's pretty much exactly a 30m rap to the Tannin ledge. The rap goes down the side of the pipe, well away from the route, and even with a 70m rope, it'd be very hard to hit a Tannin belayer when throwing it. 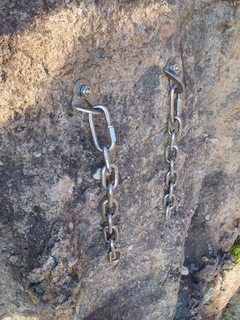 The rap anchors in the gully below Tannin have been there quite a bit longer, I think, and are galvanised sleeve anchors bolted directly through chains. They're on the side of the Horn Piece pipe that faces Dirge. that's a weird location for an anchor. If you were climbing to the top of the route, you'd be better of just walking off, so was it meant to clip and lower??? Does anyone know who put it in and what the thinking was? I'd speculate that it was intended to be used as a rap station after climbing Conifer Crack or Wyrd, as an alternative to the walk-off, given that it is positioned exactly 30m up from the next ledge, and it is off the side of the route, in a position that would unnecessarily force a hanging belay if you tried to use it for that. 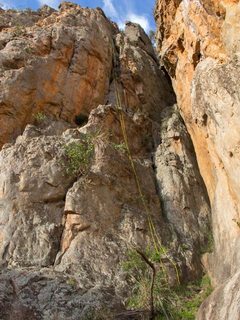 You couldn't lower off it with a 60m rope, as the climb to reach the anchor is longer than the rappel directly below it. Maybe it looks worse from the pictures, but it doesn't look like somewhere I'd want to scramble unroped to? THose lower anchors have been there for years as well. Other than being Gordy specials (galvanised and bolts straight through the chain, a crappy set up), i think they are a good idea. 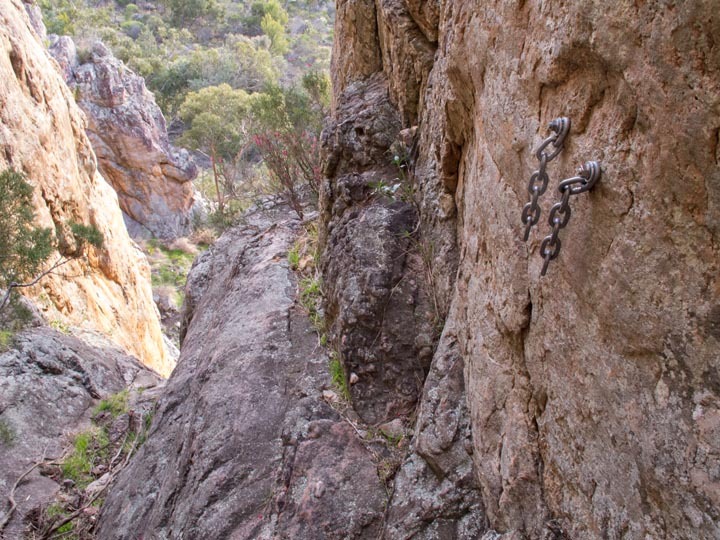 Safe to get too, not over a route, better than crowding climbers, belayers and abseilers on the Horn Piece ones and I haven't noticed problematic rock in the abseil line. Yeah, the safety of approaching those anchors unroped isn't ideal, but it's really only a grade 3-4 downclimb through the end of CC pitch 2 to get to a point where, standing on a ledge, you can reach into the gully to clip a personal tether into the bolts. But I guess the bolts couldn't have been placed in a higher, more accessible position, as then you'd risk people rapping off the ends of their 60m ropes. So it's fine for anyone climbing Wyrd as they could easily handle the downclimb, fine for anyone climbing the first two pitches of CC, as they could just build a trad anchor in a more comfortable position left of the rap bolts and be able to reach the bolts while safe on their anchor, and fine for anyone climbing all 3 pitches of CC, as the downclimb off the pinnacle is possible sketchier than the downclimb to the rap station! Crappy? Apart from the justifiable criticism of using galv, what's your point here? > i think they are a good idea. There are 57 messages in this topic.